If you are like me and can never resist having the "whole set" we have bundled the entire set of 11 Series I projects into a single download, at a special reduced price. All 11 pdf files have been zipped into a single downloadable folder. Regular price if purchased separately would be 88.00 Buy the set and save 8.00. It's like getting a project for free! Download is in PDF format. 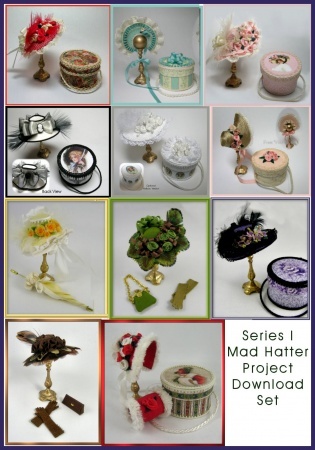 It contains complete instructions with dozens of photos, full size pattern pieces for the hat and the hatbox, and full color artwork for the hatbox.